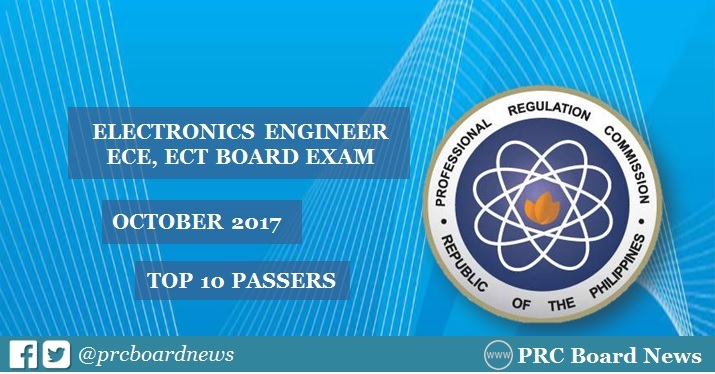 The October 2017 Electronics Engineer (ECE) and Electronics Technician (ECT) board exam top 10 or topnotchers together with other results - list of passers, top performing schools and performance of schools are out online today, October 27, 2017 or in four (4) working days after the last day of exam. Dino Dominic Forte Ligutan from De La Salle University (DLSU) - Manila aced the board with 94.40%. The Professional Regulation Commission (PRC) administered the licensure exam in the cities of Manila, Baguio, Cagayan de Oro,Cebu, Davao, Lucena and Tuguegarao on October 21 and 22 for ECE and October 23 for ECT. In the same period last year (October 2016), Masaru Quemquem Nakaegawa from University of Santo Tomas (UST) aced the board with 92.30%. Meanwhile, University of the East (UE) - Caloocan graduate Ronnel Padiernos Dayawon, Hexina Espiritu Madolid from De La Salle University (DLSU) - Dasmarinas and Voncarlo Giovanni Dideles Pasco from Technological University of the Philippines (TUP)-Visayas earned the highest spot in the October 2016 ECT board exam. In the October 2015 ECE board exams, Emiliano Marcelo Tan from the University of the Philippines (UP) - Diliman led the passers with of 91.20% average grade. Here's overview of topnotchers for ECE and ECT board exam in the past two (2) years.